Watching your parents age is a difficult, challenging part of life. It brings stresses you may not anticipate, and the reversal of roles can be a complex maze of emotions. During this time, you may feel hesitant about what your next step should be, and you probably have many questions about how to handle the physical and mental challenges your mom or dad is facing. In all of the uncertainty, it’s easy to neglect your own physical and emotional needs. That can quickly lead to exhaustion and deteriorating health, especially if you are trying to juggle work and family responsibilities at the same time. The first step in coping with the demands of caregiving is to acknowledge the things contributing to your stress. The second step is to establish habits and patterns that help you maintain stability. Fear—You may fear change, or you may fear the reality that your parent is declining in health. If you have always considered your parents to be strong, reliable influences in your life, you may fear losing their guidance. Anxiety—If you’re juggling responsibilities at home, with your spouse and children, and with your parents, you may feel anxious about getting it all done or not having enough time and energy in the day. Sadness—Acknowledging that your parents are losing their ability to care for themselves can evoke deep sadness, especially if they are also experiencing mental decline. Anger—Dealing with aging parents can sometimes resurface old hurts and resentments. You may also experience anger with the current situation and how life seems to be moving beyond your control. Stress—All of the circumstances above—physical changes, time demands, mental decline, and family responsibilities—create a perfect storm of stress that may seem insurmountable. It is important to acknowledge these emotions rather than trying to suppress them. They are all normal, and it’s important to find healthy ways to deal with them. That’s the second step in learning to cope with the stress of caregiving. Caring for yourself in this time of change helps you manage the new dynamics you are experiencing in your family. Let’s take a look at some of the ways you can make self-care a priority. Talk about your emotions with someone you trust. Don’t bottle your emotions up inside. Instead, find a healthy outlet for them by talking through them with someone you trust such as your spouse or a close friend. Take each emotion as it comes and try not to have expectations about how you should feel. Lean on family and friends. Build a support network around you that can help you manage the logistics and emotions of caregiving. Ask family members to share the burden by contributing either financially or with their time, and don’t be shy about asking a close friend to listen and offer advice as you talk through ideas or difficulties. Care for your spirit. Take time to have quiet time or pray every day if that’s something that helps you. Find a quiet place where you can sit and close your eyes, breathe deeply, and calm your mind. If church is part of your life, don’t neglect attendance. The support of people who care about you is vitally important as you walk through the difficult challenges of caregiving. Take time for things you love. Sometimes the best thing you can do is step away from the stress and lose yourself in something you love. Whether that’s gardening, cooking, reading a book, going for coffee with a friend, or spending the day out in nature, this is an important part of keeping the stress manageable. Don’t put your life on hold. 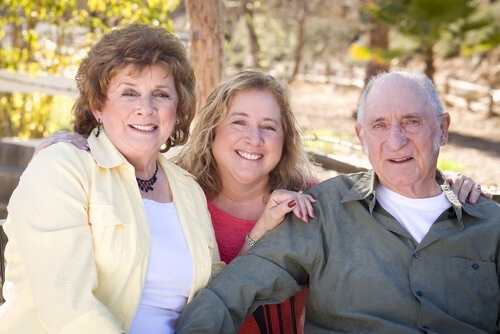 Depending on your parents’ needs and stage of life, they may need the assistance of a caregiver for many years. You won’t serve yourself, your spouse, your children, or even your parents well if you put all the other parts of your life on hold while you care for your mom and dad. Take breaks, be present for the important moments in your life, and continue investing in your own personal goals. There may come a time when you need to take family leave from your job to care for your parents, but don’t make this a long-term care strategy unless that’s really the desire of your heart. Planning for your parents’ care can be overwhelming logistically as well as emotionally and physically. Here are a few tips to get you started. Start gathering insurance documents, important paperwork, and medical information before you think you need them. You’ll be glad you can put your hands on them immediately if an emergency arises. Talk with your parents about their wishes and expectations rather than making assumptions. Depending on their child for basic needs is new and possibly frustrating for your mom and dad, so involve them in the decision-making process as much as you can. Consider getting assistance with caregiving. When you have looked at all that will be involved with caregiving for your parents, you may find that it’s too much for you to handle alone. If that’s the case, consider getting assistance from a professional caregiver who can come into your parents’ home a few times each week to help with housekeeping and routine tasks. As your mom and dad’s needs increase, you can adjust the plan to be sure they are well cared for. Having an action plan in place goes a long way toward giving you peace of mind about your parent’s health and well-being. As you begin to plan, involve them in the process and get as much help from your family and friends as possible. Watching your parents age is never easy, but you can remove much of the stress by taking steps to ensure a positive care situation both for your parents and yourself.